The world's most productive and widely-used radio telescope, the National Science Foundation's Very Large Array (VLA), can be improved tenfold with an expansion project proposed by the National Radio Astronomy Observatory (NRAO). "This project will ensure that the scientific community has a state-of-the-art research tool to meet the astronomical research challenges of the 21st Century," said Paul Vanden Bout, NRAO Director. Plans for the Expanded VLA (EVLA) and its potential for new scientific contributions were described today in a series of presentations at the American Astronomical Society's meeting in Rochester, NY. The EVLA project plans to replace dated equipment left over from the VLA's original construction in the 1970s and add eight new radio- telescope dish antennas to the current, 27-dish system. It received a strong endorsement last month when the Astronomy and Astrophysics Survey Committee of the National Academy of Sciences gave the project one of its highest ratings as a priority for the next decade in its report entitled "Astronomy and Astrophysics in the New Millennium." "The Survey Committee's endorsement shows that the astronomical research community strongly supports the Expanded VLA," said NRAO astronomer Jim Ulvestad, who spoke to reporters at the AAS meeting. "The VLA has long been a unique and critical resource for all of astronomy, and we look forward to turning it into a dramatic, new research tool." The VLA Expansion Project will use modern electronics and computer technology to greatly improve the VLA's ability to observe faint celestial objects and to analyze their radio emissions. A set of eight new dish antennas, added to the current 27-antenna system, will allow the VLA to produce images with ten times greater detail. 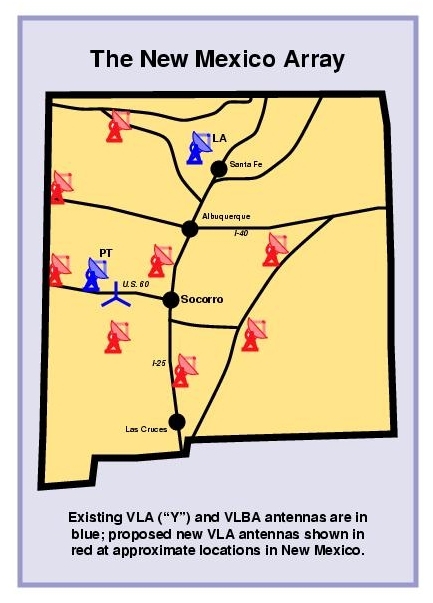 The project will build on the VLA's current infrastructure, including its 230-ton dish antennas, the railroad tracks for moving those antennas, and the existing buildings and access roads. The Expanded VLA will be operated by the same skilled staff present today. "This project will increase the capability of the VLA tenfold in all scientific aspects," said Rick Perley, NRAO's project scientist for the VLA Expansion Project. "This tremendous new capability will cost the NSF about $140 million, far less than the present value of the VLA. In addition, the operational costs remain about the same and the maintenance costs may even fall because of the increased reliability of newer equipment," Perley added. The VLA Expansion Project is a two-phase program, with the detailed plans for the first phase already submitted to the NSF. The first phase will cost a total of $76.2 million, $49.9 million of which is requested from the NSF. "We already have a commitment of $2 million from Mexico and are negotiating with Canada for key technical equipment worth $10 million," Perley said. "By bringing all the VLA's electronics up to today's state of the art, using modern fiber-optic data transmission techniques, and adding new antennas, we get an essentially new astronomical instrument with vastly increased capabilities at a fraction of the cost of starting from scratch," Ulvestad said. Better images of cosmic "nurseries" where new stars are being formed and disks of gas and dust surrounding those new stars are forming into systems of planets. "These regions are obscured by gas and dust from view by optical telescopes. The EVLA will be a prime tool for understanding the processes ongoing in these regions," said NRAO astronomer Mark Claussen, who presented a paper on this aspect of the EVLA. Improved ability to study the mysterious, shrouded region at the center of our own Milky Way Galaxy, where a black hole more than 2.5 million times more massive than the Sun lurks. Ability to gain important new information about the atmospheres of other stars, their life cycles, and how events on other stars relate to processes on our own Sun, which also will be studied much more effectively with the Expanded VLA. The capability to help answer numerous other unresolved astronomical questions, including the numbers of small asteroids in the Solar System, the origin of clusters of galaxies, the nature of binary stars that emit powerful bursts of X-rays, and the size and structure of the Universe. The Survey Committee report listed the Expanded VLA as an important contributor to new understanding in three high-priority research areas for the next decade: studies of star and planet formation; research into black holes; and unraveling details about the "dawn of the modern universe." Dedicated in 1980, the VLA is the most powerful, flexible and widely- used radio telescope in the world. It brought dramatically-improved observational capabilities to the scientific community two decades ago, and has contributed significantly to nearly every branch of astronomy. More than 2,200 scientists have used the VLA for more than 10,000 separate observing projects. 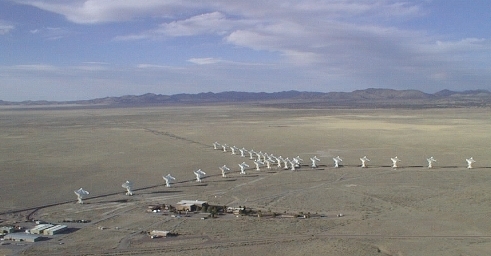 Astronomers seek more than twice as much VLA observing time than can be provided. Since the VLA's dedication, many technical improvements have made it much more capable than its original design contemplated. However, some of the technologies incorporated into the VLA during its construction, while highly advanced for their time, now limit its capabilities, causing it to fall well short of its potential as a tool for science.